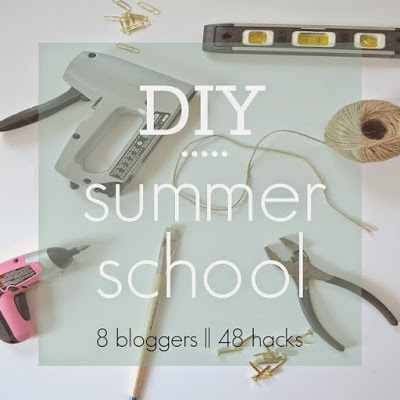 Welcome back to DIY Summer School! 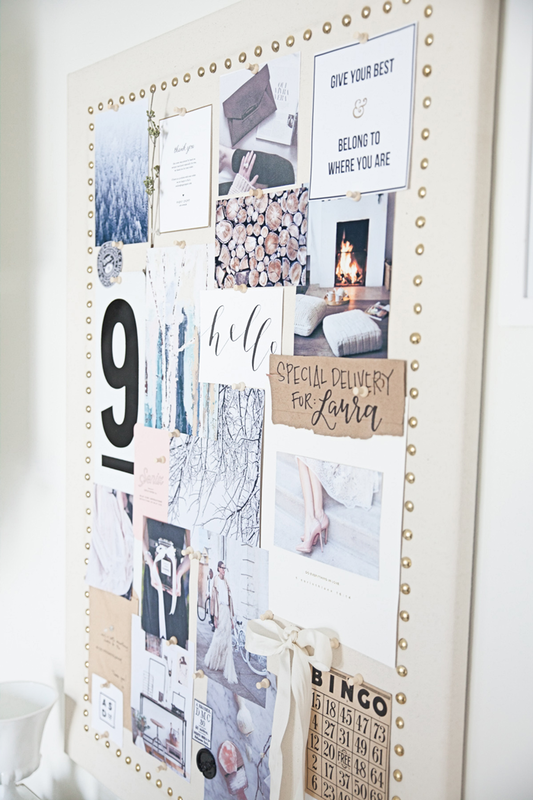 Today's theme is "Craft Store" and I've chosen to share with you one of my favorite DIY projects: The fabric wrapped bulletin board in my home office. I've been wanting to properly share the instructions with you for, like, ever so once again a huge thanks goes to Beth of designPost interiors for inviting me to this series and giving me the motivation! I first noticed a board like this in the Ballard Designs catalog all the way back when I started this blog. I knew I needed to have it, but unfortunately it was like $300- that's insane. (And it's since sold out anyway). 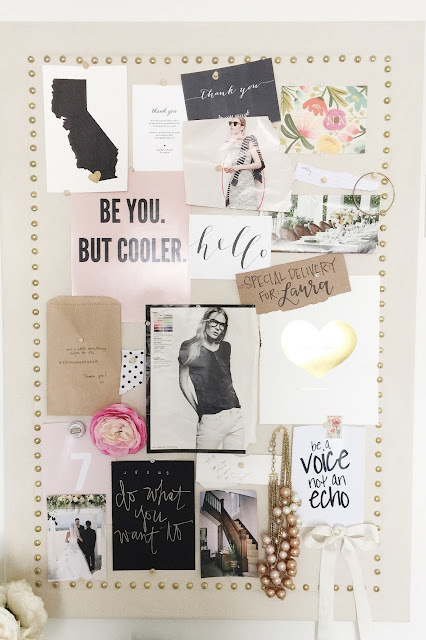 Then I saw a version in the ridiculously gorgeous apartment of Alaina Kaczmarski from The Every Girl and it dawned on me I could probably make it. I pulled an old bulletin board out of the basement, bought some duck cloth, nailheads and spray adhesive, and went to town. It worked like a charm. A solid color fabric without any obvious straight lines or patterns will be more forgiving of any slight crookedness as you apply. Trust me from experience, a pattern that you have to line up perfectly straight, like stripes or trellis, will drive you crazy forever if you don't get it right. Start in the center of the fabric and work your way out to smooth the wrinkles. The spray adhesive doesn't dry immediately so you have some time to pull up the fabric and re-stretch it if you need to. I used a yard stick to space the nailheads evenly. Just lay the stick alongside the frame and use it as a rough guide to space the nailheads about an inch apart. 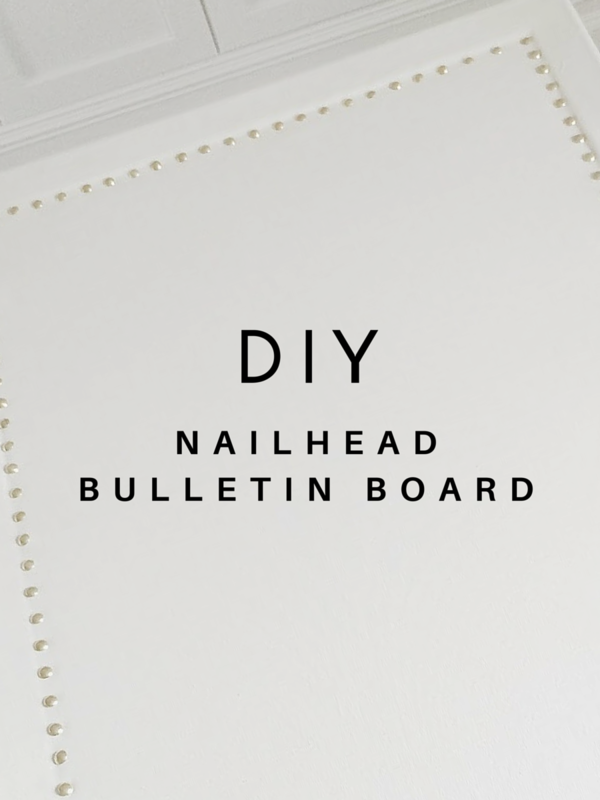 Use the inside edge of the frame as a guide to make the line of nailheads straight. If the edge of each nailhead just slightly touches the frame, your line will be perfect. Make sure you place a nailhead in each corner (even if you have to get slightly off in your spacing). If there isn't one in the corners, they'll look rounded when you stand back to look at it. Once the nailheads are down, you can spray a little more adhesive on the frame. I used a nail gun to attach the fabric to the back of the bulletin board and it worked perfectly. To keep the staples from scratching the wall, I covered them with duct tape on the back. It might not be the prettiest but it does the job well! Alrighty, those are my tips. Like I said, you can visit Alaina at Live Creating Yourself for the full supply list and step by step tutorial. This is one of my favorite things I've done and it was so cheap and simple. It took less than an hour, and you can get all the supplies you need in one stop at your local craft store. And then you can set out to decorate it! (The best part of all). The most fun thing is changing it seasonally with new inspiration and the colors that I'm currently craving. 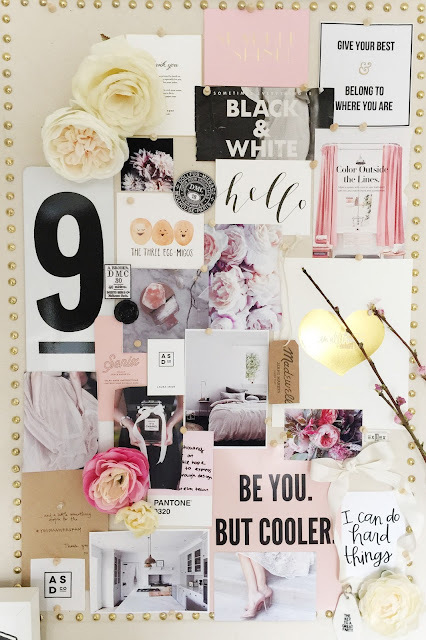 For more DIY & decor inspiration, follow Avery Street Design on Bloglovin'! Now before you race to Hobby Lobby, be sure to check out today's other craft store themed DIY's! 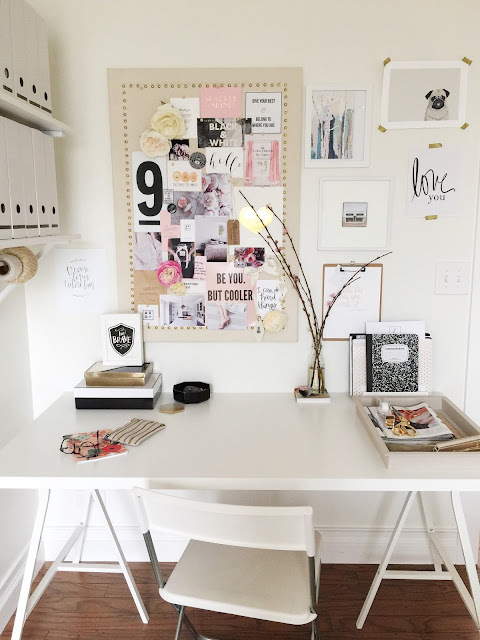 Bloggers, do you have a craft store project to share? Feel free to link it up below using the blue button! 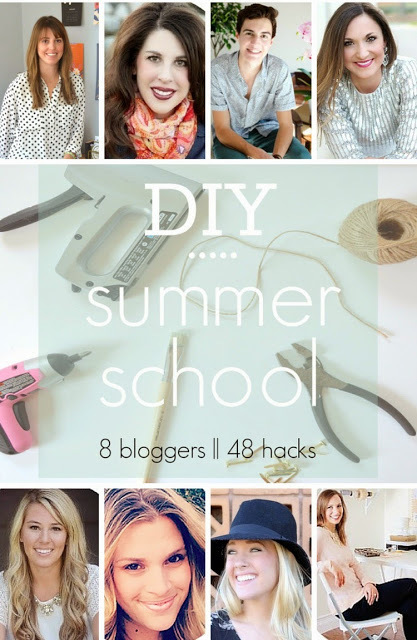 And as always, play along on Instagram by sharing your projects with #DIYSummerSchool. See you next time! Such a pretty spot to pin inspiration! Thanks Jennifer! Yes, I am so happy with how it turned out! Love your memo pin board. The nailhead trim is perfect. What a great idea. Can't wait to make one of these. LOVE! Thanks Lindsey! It is so pretty, and feminine without being obvious. I love it! Such a great background for all of your pretty inspiration! Thanks Beth! It's nice to have a pretty board in real life that I actually look at... Pinterest is wonderful but I never see any of my pins again after I pin them! This is fabulous – the studs look so good!